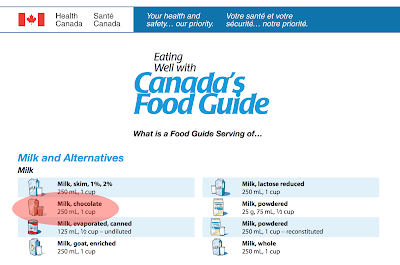 Weighty Matters: Once Again I'll Ask, Where The Hell Is Canada's New Food Guide? 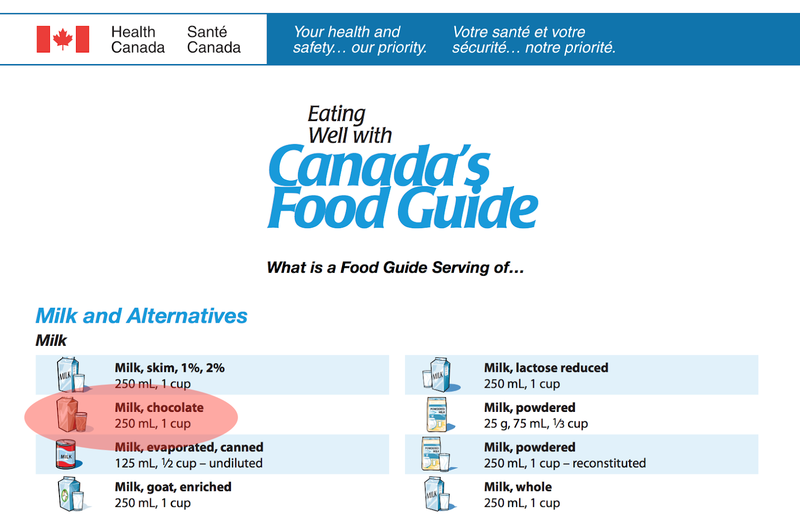 Once Again I'll Ask, Where The Hell Is Canada's New Food Guide? This post was first published back in June. Since then, still no Food Guide, as well as the real possibility that not releasing the Guide influenced the New Brunswick provincial election, and just this past week, an incredible dive into juice, food politics, and our as yet unpublished guide. I really can't wrap my head around why it's not out yet beyond politics. That's not something this country should be proud of. In case you missed the news, New Brunswick recently banned the sale of chocolate milk and juice in their schools. It's a welcome move, and one that will be undoubtedly be adopted nation wide following the long delayed publication of Canada's next Food Guide. "Don't tell Mom, but Chocolate Milk is good for you"
"One thing we're doing right now is doing a reassessment of all of those things and certainly me personally, I agree with Yoni that it (chocolate milk) should not be there either"
"You won’t be seeing that anymore … and there’ll be a fair number of new materials coming out in the next few months." I also know this because even McDonald's appreciates that chocolate milk, with more calories and sugar drop per drop than Coca-Cola, shouldn't be routinely offered to children. So here's my first question. If, in 2007, Canada's Food Guide had explained that chocolate milk is to milk what apple pie is to apples, and that it should be considered a treat rather than a health food, and that no, juice is not the same as fruit, do you think we'd be seeing these actual responses and comments posted on Facebook and on the CBC article in response to the news out of New Brunswick? "How the hell can juice be bad for you I doubt orange and apple and cranberry juice is bad for your health CFDA would have ban the stuff decades ago"
"It is crazy and stupid. especially since the school officials are comparing the natural sugars found In the cocoa that makes it chocolate to the artificially added high fructose corn syrup used to sweeten coca cola." "Ugh get a life people! Chocolate milk is some parents only option to get their kids to drink milk. And as far as juices they sell apple and orange at school so are they now telling us apple and OJ juices are bad??" "I agree, pop and juice fine. Chocolate milk is filled with nutrients." Because the thing is, though no one shops with Canada's Food Guide in hand, its recommendations do permeate national consciousness. And more to the point of this post, they inform school food policies. Once the new Food Guide is published, and assuming it explicitly recommends limiting sugar sweetened beverages and juice (and it will), all provinces will undoubtedly soon fall in line with New Brunswick (unless of course the Conservatives, as they promised prior to their election, repeal the ban). And here's the most pertinent question. It's been 5 years since Dr. Hutchinson agreed chocolate milk should be off the Food Guide's menu, and 3.5 years since he went on record stating that juice's days are also numbered, so how is it possible that we're still waiting?